You can take attendance via a list or seating chart. Toggle between the two types using Seating Chart or Attendance List at the top. Another option for taking attendance is to use the seating chart you’ve created for the section. 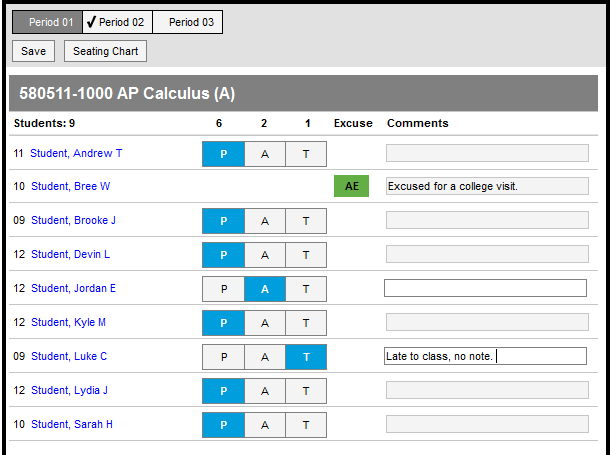 The period you’re recording attendance for appears selected at the top, as with Period 1 in the example below. The Course and Section displays at the top of the attendance list. If you teach multiple sections in a period, each appears in its own section. To use seating charts for attendance, mark the Use Seating Charts for Attendance option in your Account Settings. Use the P, A, and T buttons to indicate which students are Present, Absent or Tardy. The totals of each type calculate at the top of the columns. Excuses can only be entered by the attendance office; teachers cannot enter or modify them. Include any information you may have about the attendance event in the Comments. Click Save to submit the attendance record to the attendance office. Click on a student’s name to view their demographic and contact info. If any attendance information has already been entered by the attendance office, that information loads automatically, as with Bree Student in the example above.